When it comes to making breakfast or side dishes, crispy tender potatoes are always a great choice. 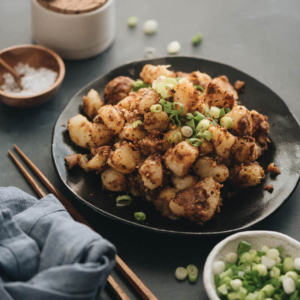 If you’re tired of the usual seasonings and would like to try something bold and flavorful, check out this Chinese spice blend for sauteed potatoes. Making this spice mix is super simple – just blend some chili flakes, cumin power, and a touch of Sichuan peppercorn. The potatoes are further enhanced by butter and some garlic. The blend was inspired by the one used for Xinjiang style lamb skewers. It’s very straightforward and yields a rich, savory taste. Of course you can use the same blend to roast potatoes, as well. Sometimes I find that sauteeing is more convenient than roasting for a side dish, because you might already be using the oven for the main dish. 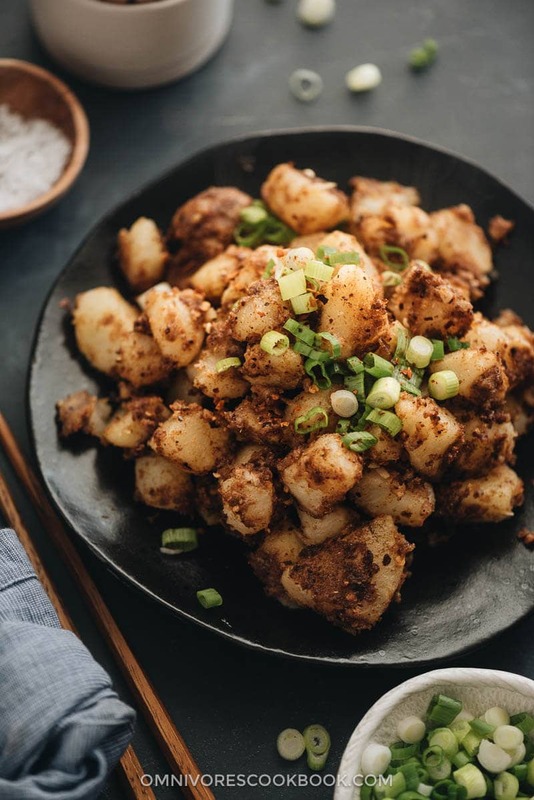 There are many ways to saute potatoes. I found the most effective way is to parboil them first, then saute them in a hot pan. The potatoes cook much faster this way and the inside will be very tender. These sauteed potatoes go well with so many things. You can serve them with eggs and sausage to make a traditional breakfast. Or you can serve them on the side of this 5-Ingredient Baked Chicken Thigh to make a quick dinner. You can also serve them as part of your summer Chinese BBQ Party. Add potatoes to a medium pot with 2 teaspoons of salt. Add water to cover potatoes, bring to a boil, and continue to boil until the potatoes just turn soft, about 5 minutes. Rinse the potatoes with tap water to cool. Drain potatoes thoroughly and let them dry a bit. This helps crisp up the potatoes. 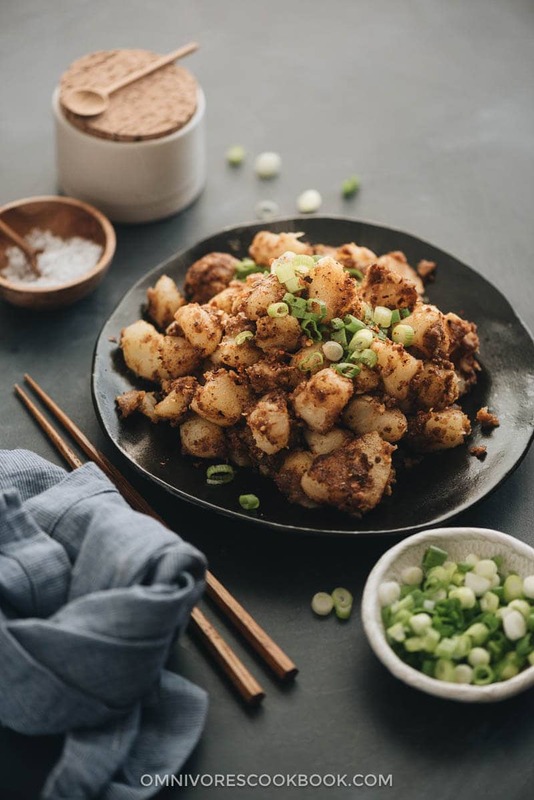 While boiling the potatoes, mix the chili flakes, cumin powder, ground Sichuan peppercorn powder, and the remaining 1/4 teaspoon salt in a small bowl. Add butter to a large non-stick skillet and heat over medium-high heat. When butter has melted and stopped bubbling, spread the potatoes in a single layer. Let cook until the bottom turns golden. Flip to cook the other side until golden. Add the garlic and sprinkle with the spice mix. Cook and stir until everything is mixed well together. Garnish with green onion, if using. Serve hot as a side. The recipe was originally published on Sept. 7, 2013 and updated by Jul. 15, 2018. 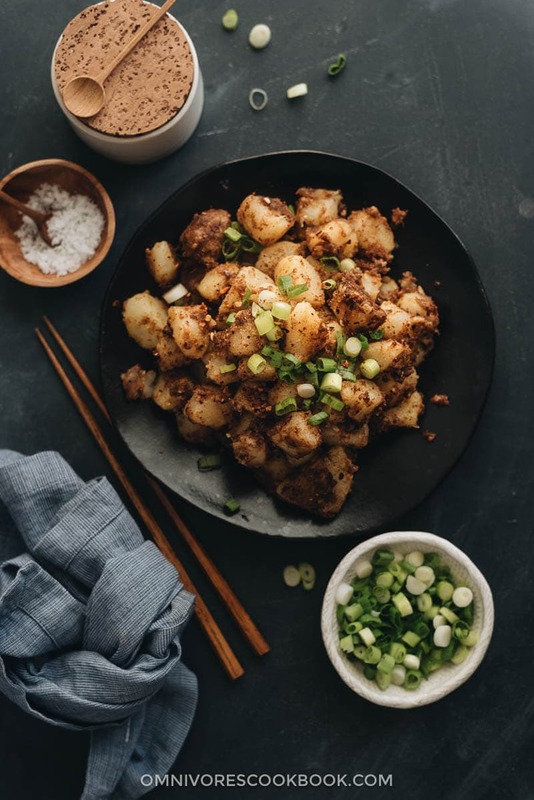 I love love love that you used sichuan peppercorn on these potatoes. What a great twist! I am totally going to have to try these!